What Does it Take to Live a Fulfilling Life? Luis Huete holds a Law Degree, an MBA from IESE Business School and a DBA from Boston University. He was a Fullbright Scholar and his dissertation on commercial banks’ services strategy was awarded by the Decision Science Institute Award as the best dissertation of the year in 1988. He has worked as a researcher at Harvard Business School developing scientific material and taking part in a research project sponsored by Bell Communications. He has been a professor at IESE Business School since 1982 and has lectured in Harvard Business School´s Achieving Breakthrough Service and Advanced Management programs. As a visiting lecturer, Luis regularly participates in advanced management programs at prestigious business schools such as ESMT (Germany), ISEM Fashion Business School (Spain), Louvain (Belgium) and Deusto Business School (Spain) among many others. In addition, he collaborates with the corporate universities of Bupa (U.K.), ISS (Denmark), Omnicom (USA), Telefónica (Spain), etc. Luis is the author of ten top management books in Spain and his articles are regularly published in business publications. He is a frequent speaker at conferences and industry gatherings and has provided training and consulting services to more than 700 companies in 70 countries, including 50% of the firms listed in Spain’s Ibex 35 stock market index. 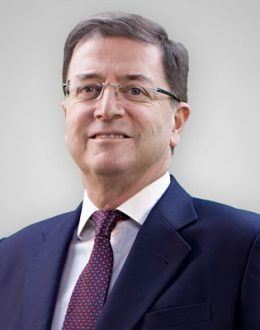 He has worked together with CEOs and their teams to define organization structures and major transformation projects for companies such as Banco Santander, BBVA, IBM, Oracle, McDonald´s, Adecco, Intercom Group, Opel, Iberostar, Grupo Pascual, Ricoh, Loewe, Campofrío, Lilly, Vodafone, Gilead, Six Senses (Thailand), Banesto, Larrain-Vial (Chile), ISS (Denmark), Telesp (Brazil), Movistar (Argentina, Chile and Central America) among others. Luis also serves on the boards of companies such as Six-Senses Luxury Resorts & Spas in Thailand and Altia Consultores, Corporación Financiera ARCO and Ecointegral in Spain. He also belongs to the Global Advisory Board of the Oxford Leadership Academy (UK), IBS (México), VipScan (Spain), Abypersonalize (Spain) and is a patron of the Modern Art Foundation NMAC (Spain). He has received three awards from the Actualidad Económica magazine for best 100 business ideas of the year. According to the Institute for International Research (IRR), three out of four executives consider him as “the best Spanish management guru”. The publication Who´s who en el Management Español highlights Luis as one of the most influential players in this field. Luis lives in Madrid with his wife Maria and their four children.